Bold plans to use desert sun to supply northern energy needs were dashed when, in 2013, investors pulled out of the gargantuan Desertec project. Its solar plants, spread across the Sahara desert, were to provide 15 percent of Europe’s electricity by 2050. But hope for Saharan solar may be revived, as an enormous Moroccan solar plant prepares to go online. The Noor-Ouarzazate complex, located 200 kilometers from Marrakesh at the edge of the desert, is set to become the largest concentrated solar power (CSP) plant in the world by the time it is completed in 2017. It aims to generate 500 megawatts of electricity, enough to supply 1.1 million Moroccans. Noor 1, the first of its four plants, should be switched on in December 2015. The Ouarzazate complex was originally intended as the first in a series of Desertec plants that would extend all the way to Egypt. That project was backed by the Desertec Industrial Initiative (DII), a consortium of 57 shareholders chiefly from Germany, including Siemens, RWE, Deutsche Bank and E.ON. It collapsed in 2013 when all but three pulled out, fearing that Europe’s electricity grid was nowhere near ready to absorb fluctuating solar power outputs from Africa. Despite failure of the Desertec initiative, the Moroccan government has pushed ahead with the Ouarzazate complex. And the buzz around the launch could revive interest in the failed Desertec concept – although for the time being at least, North Africa will be keeping the power to itself. Morocco is a solar pioneer in the Middle East and North Africa (MENA) region, for clear reasons: The country does not produce oil, and imports more than 90 percent of its energy from abroad. Tensions with neighboring Algeria over the disputed territory of Western Sahara have made short-distance imports from Algeria’s large hydrocarbon reserves difficult. Due in part to And, its abundant sunshine, Morocco has targeted solar as the way to reduce its energy dependency. Morocco launched a National Renewable Energy and Energy Efficiency Plan in 2008, also establishing its own solar energy agency. The solar project is just one aspect of the government’s strategy to cover 42 percent of its energy use through domestic renewables by 2020, utilizing wind as well as solar power. Hakima el-Haite, Morocco’s energy minister, has said the Ouarzazate project will be “the most important solar plant in the world.” But there are still major hurdles to its completion, boiling down mostly to cost. 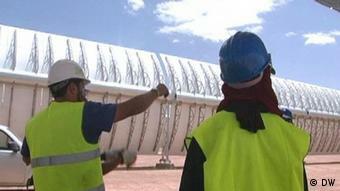 Like the other planned Desertec plants, the Ouarzazate complex uses CSP technology. But since 2009, photovoltaic (PV) panels have become much cheaper than CSP, and are now the far more common technology. While PV panels are cheap and easily portable, CSP uses a more complicated system where giant arrays of parabolic mirrors focus sunlight onto a steel pipe, heating liquid inside that is then used to create steam to power turbines. The advantage of this system is that it can store heat, and continue generating electricity during the night and on cloudy days. The disadvantage is that it is requires greater financial investment – and a lot of sunlight. It’s therefore suitable for desert environments. 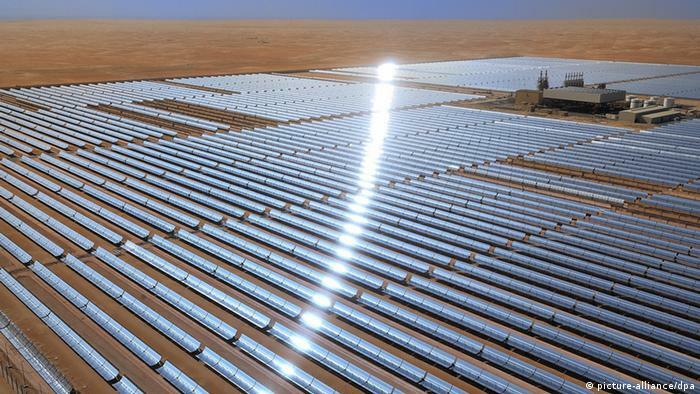 Morocco is not the only MENA country building large solar plants. In October 2014, Tunisia announced the TuNur project, which aims to build 10 CSP plants, each generating 200 megawatts. Gulf States are also becoming increasingly interested in turning their abundant sunshine into power. Moroccan King Mohammed VI has said he wants to see his country’s solar power run all the way to Mecca. But talk of exporting this power to Europe is fading as it becomes clear that Europe will not be able to upgrade its aging infrastructure in time to receive it. DII split from the Desertec Foundation – the other main organization behind the original Deseretc project – in 2013, and continues to promote desert solar projects. Chase agrees that solar installations are set to grow in the MENA region – but said the original Desertec dream was overly ambitious. 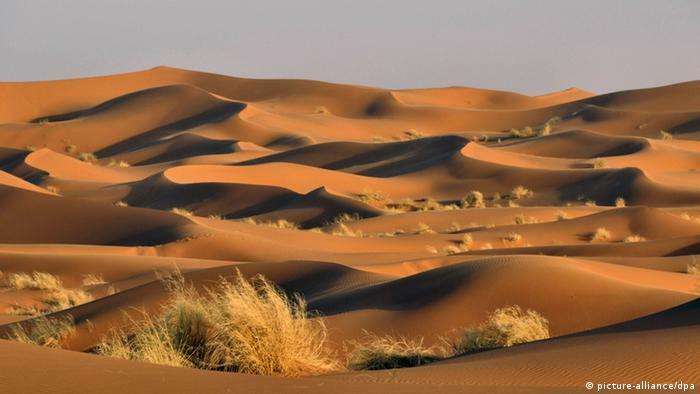 “Desertec tried to do far too much at once, when in fact the development of solar power in North Africa needs to be local projects supported by governments,” she added. So the dream of Saharan solar may be still realized – but its development will likely take a more regionally focused path.